Comfrey (Symphytum officinale) is a Medicinal Herb Used in Traditional Herbal Medicine. Comfrey (Symphytum officinale) has traditionally been used to treat wounds and reduce inflammation associated with sprains and broken bones. The roots and leaves of comfrey contain allantoin, a substance that promotes wound healing and tissue regeneration. To assist in the healing of wounds and to prevent formation of scar tissue associated with wounds. Comfrey should not be used on open or infected wounds. Natural cream base, Allantoin, Symphytum officinale radix, natural preservative. To relieve pain associated with traumatic injury to nerves, joints, bone, muscles and connective tissues and with post-operative trauma. 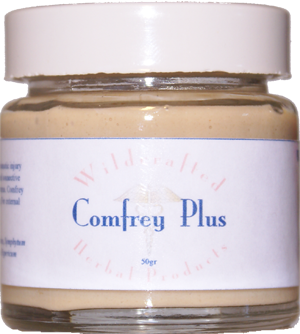 Comfrey Plus also stimulates rapid healing. Natural cream base, Allantoin, Symphytum officinale radix, Arnica montana, Hypericum perforatum, natural preservative. Vulnerary, demulcent, anti-inflammatory, astringent, expectorant. Comfrey was once used in treating fractures and hence the alternative name 'Kitbone'. The pounded root forms a mucilaginous mass, which can be bound around a fracture and which, when dry, holds the bone in place. Comfrey is an excellent wound-healer. This is partially due to the presence of allantoin. This chemical stimulates cell proliferation and so aids wound-healing both internally and externally. The leaf is used in pleurisy and bronchitis. For wounds, bruising, ulceration and dermatological complaints, the leaves or macerated root may be applied as a poultice, lotion or decoction. Comfrey is considered of benefit in neuralgia and rheumatism, applied externally. The whole plant, beaten to a cataplasm and applied hot as a poultice, has always been deemed excellent for soothing pain in any tender, inflamed or suppurating part. It was formerly applied to raw, indolent ulcers as a glutinous astringent. It is useful in any kind of inflammatory swelling. Comfrey should always be used together with an anti-septic, for example Echinacea purpurea, Calendula, or other anti-septic herb. Supportive of cell regeneration and normal tissue replacement. Used externally for skin problems and infections (extract). For bruises: crushed leaves applied directly. Poultice form is used for cuts, boils and abrasions. Used in ointment or salve form for abrasions, wounds, burns, swollen breasts and skin problems. A fomentation (roots and leaves) is used for sprains, swellings, bruises. For bruises, inflammations, ulcers, and sores, dampen the root powder with water until it's a wet, gummy mash; place in a clean cloth and apply. A hot decoction of the root is used for styes. Used as a "cast" for broken bones by pounding the root then binding the mash around a break; the mixture will set when dry. Tea was traditionally used for colds.